Technology has revolutionized the way the world conducts business. It has also revolutionized the way business education can be delivered. Recognizing these advances, the Villanova School of Business (VSB) has expanded our distinguished MBA degree online — offering the same curriculum and expert faculty as our top-ranked campus program in a flexible, convenient format. Villanova University has been ranked in the top 50 of the nation’s Best Online MBA Programs for Veterans by U.S. News & World Report. FROM VILLANOVA SCHOOL OF BUSINESS? As you research the many online MBA programs out there, keep in mind that ours is expertly designed to deliver a highly personalized, applied educational experience in an interactive online format. Online MBA programs are designed for professionals who want the flexibility and convenience of an online degree. The difference with our MBA degree online is that we offer something more. We offer the community, robust curriculum, elite faculty and quality of an established, highly ranked on-campus MBA program. You can enjoy an individualized experience, graduate with esteemed credentials, earn your place in the Nova Nation and give your career a competitive edge. Another reason the Villanova School of Business online MBA experience is invaluable is because of the quality of our faculty who are dedicated to imparting their extensive industry knowledge in the classroom. Through their firsthand insight, our students can more readily marry theory and practice. We realize that students comprehend a concept best when they practice it. That’s why we don’t want students to wait until they graduate to apply their education. In fact, our curriculum is designed to encourage students to implement new ideas at work, pursue leadership roles and share what they have learned with their peers. It’s all part of what makes the Villanova experience unlike any other. 1. Add a respected credential from a renowned institution to your resume that could lead to greater opportunities, salaries and advancement. 2. Experience the same curriculum and faculty as Villanova’s top-ranked, campus-based program. 3.Customize your degree by choosing from five optional specializations: Finance, Marketing, Analytics, International Business or Strategic Management. 4. Participate in an optional international immersion into an emerging economy. 5. Cultivate strong relationships with highly talented peers in small classes; approximately 20 students per online section. 6. Build essential leadership skills for today’s complex business world. 7. Engage in live networking with peers and faculty in our weekend residency experience. 8. Learn from expert faculty members who consult regularly in a variety of industries with top corporations around the world. 9. Join a university with a vast global alumni network. 10. Earn your degree from an AACSB-accredited business school. What does it take to prepare students to be leaders for a better world? It takes better leaders. Our faculty members are nationally recognized experts in their fields. We are a community of scholars who take a personal interest in the success of our students. We designed our online MBA to blend formal business training with real-world application. The most important step in helping our students become successful business executives and first-class global leaders is to attract highly talented Villanova School of Business faculty. The online MBA consists of 21 courses taken during six semesters — each of which is divided into two terms. You can complete the 48-credit hour program in as few as two years. The community-building aspects of the program begin during one intensive Leadership Challenge campus residency in your first or second semester and continue in two practicum experiences at the mid-point and end of the program. We intentionally designed our online MBA with hands-on components to facilitate collaboration and peer learning. Meeting other students in person, working closely with them on team projects and getting to know the faculty truly gives you a sense of the Villanova community — and your role in it. As part of your final capstone course, you also have the option to participate in a seven-day international immersion. Through your coursework, you will explore current market issues that are challenging global organizations. Then, in true Villanova fashion, we take the experience a step further. Our students can travel abroad to an emerging economy to visit with companies, work on projects and experience the business culture firsthand. At the mid-point of the program, students also complete the Social Enterprise Consulting Practicum. Lauded as one of the best courses in the program, it involves students working in teams for a client serving the common good and performing work that gives back to the community. YOUR ONLINE MBA FROM VILLANOVA? In today’s global business landscape, only one thing is constant: change. The professionals who understand how to help organizations innovatively respond to this change will drive results and achieve success for their company — and themselves. And that’s exactly what an online MBA from the Villanova School of Business can prepare you to do. Your graduate school education is an investment in your future with a strong ROI that can be measured in potential salary increases, promotions and expanded growth opportunities over the course of your career. By choosing one of our four optional concentrations — Finance, Marketing, Analytics, International Business or Strategic Management — you are positioning yourself for success as a leader with specialized business knowledge. At Villanova, we believe that for you to be a responsible and ethical business leader, you must continue to develop and grow as a person. That’s why we design the rigorous coursework and hands-on learning experiences of our online MBA to challenge you. Within the 21 courses needed for your online MBA, you have the opportunity to select electives that best suit your career goals and personal interests. Gain the skills and confidence needed to succeed in the next chapter of your career and capitalize on advancement opportunities within your field. Enjoy personalized and immersive interaction with industry-leading organizations and thought leaders — both in and out of the classroom. Develop the knowledge and skills to make a powerful impact on business. Stand out in the business world with an exceptional credential that gives you a leg up in the job market. 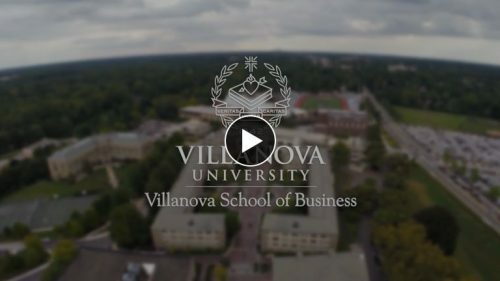 As an online MBA student in the Villanova School of Business, you will become part of a distinguished and supportive learning community and active alumni network. The structure and design of each course in the program supports a high-touch learning environment by leveraging tools such as videos, discussion boards and interactive case studies, facilitating open exchange and communication. Small classes help build connections between peers and allow faculty to provide individual support. As a student in our online MBA, you are also invited to attend campus events. We provide the tools, connections and support that can help you become the kind of business leader who can build a better tomorrow. Our core values — combined with our role at the forefront of business and education — ensure that you will have the opportunity to acquire the expertise, insights and cross-cultural exposure to help you succeed in the global marketplace. Now is the time to immerse yourself in global business with a master’s degree from Villanova University. Part-time, on-campus options are also available. For more information, click here.